PHOTO SUBMITTED Pictured are the two seventh-grade classes from New Riegel High School (on screen) and Calvert Catholic High School working in collaboration on projects in line with Apple’s 1997 “Think Differently” campaign. Two area schools have been tasked with “thinking differently” over the past week, working in collaboration across digital and city lines. Seventh- and eighth-graders from Calvert Catholic Schools and New Riegel Local Schools have been working in partnership on projects focused on the lives of so-called misfits, Dave Kraft, technology teacher at Calvert, said. Kraft and John Kramer, technology integration specialist for the North Central Ohio Educational Service Center, are bringing their classes together for this project. The projects took students and put them together electronically in different classrooms, different buildings, even different districts and challenged them to put together a project. The projects were based on Apple’s 1997 “Think Differently” advertisement campaign. Each student selected from a list of iconic figures such as John Lennon, Amelia Earhart and Albert Einstein. From there, they worked in groups using Google Slides – a similar software platform similar to PowerPoint – to create a presentation of the person’s life. Ashlynn Deats, a student from Calvert, said she and her group selected Earhart. In the presentation, Deats and her team detail how Earhart thought differently, how she changed history, how she influenced others, how she influenced society and what happened to her. Kraft said this is the first time the schools have worked like this together. “This has been a nice way for students to connect with other students,” Kraft said. 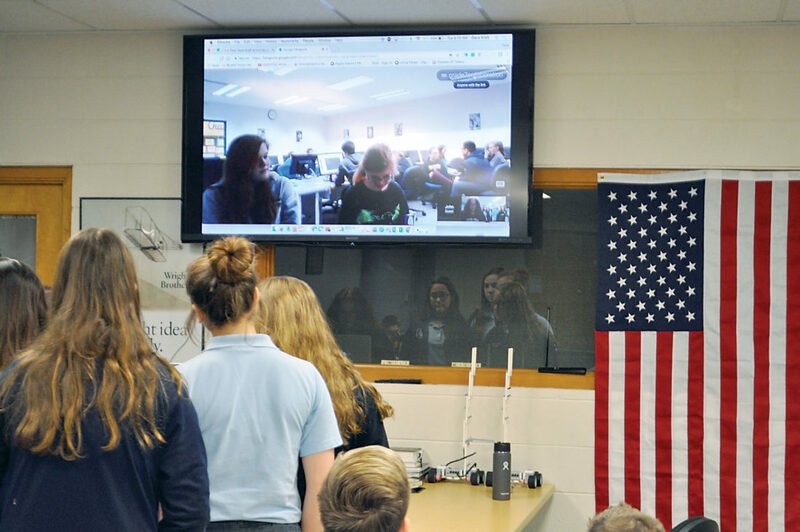 To communicate, the students have a messaging system to write back and forth and, in case they need to speak with team members from the other school, Kraft said they are able to talk face-to-face in a live video stream. Kraft said the students have been very engaged and are working well together. Kramer too agrees communication is the major challenge between schools. This project, according to Kraft, is bonding the two schools together. New Riegel students Ally Rumschlag and Ann Mahling are working on projects with their teams about Einstein. Rumschlag said she has found the project to be easy, but is was hard to get used to. “It has been hard to try to guess what the others are trying to say,” Mahling said. The projects lead up to presentations which are to start Thursday. Kraft said this opens more opportunities to collaborate like this in the future with New Riegel and other school districts.